"When you're teaching kids to write, you're teaching them to think. Writing is the window through which all thinking starts." Writing is a key aspect of the curriculum and along with reading, speaking and listening, it makes a significant contribution to the development of children as thinkers and learners. It is a central part of the school’s role that all pupils develop their writing ability and enjoy the process of cultivating this life-long skill. We strive to provide children with exciting, purposeful and inspiring contexts in which to become writers. We aim to ensure that there is coherence, continuity and progression within our teaching throughout the school. Ensure children can write using a legible, joined script using the Letterjoin handwriting programme (see handwriting policy). Apply their understanding of phonics and spelling rules to all forms of writing. Both transcription (spelling and handwriting) and composition skills (articulating ideas and structuring them in speech and writing) are explicitly taught during English lessons. Transcription and composition skills are then applied and developed in writing for curriculum areas. The correct technical vocabulary is modelled to children which the children then use to discuss their own writing. Throughout the teaching of writing, links are made to reading. 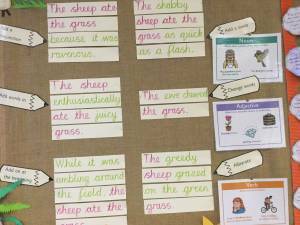 At the start of a new writing unit children analyse the structural and language features of a specific text type . Pupils are taught how to plan, edit and redraft their writing, as well as producing a best copy. Pupils are taught effective composition by forming, articulating and communicating ideas, before organising them coherently for a reader. This requires clarity, awareness of the audience, purpose and context, and an increasingly wide knowledge of vocabulary and grammar. Writing down ideas fluently depends on effective transcription: that is, spelling quickly and accurately through knowing the relationship between sounds and letters (phonics) and understanding the morphology (word structure) and orthography (spelling structure) of words. This understanding begins in EYFS through daily, high quality phonics lessons. In the Foundation Stage, children are encouraged to attempt their own emergent writing and their efforts are valued and celebrated. As their phonic knowledge increases, so does their ability to write independently. At the same time, their knowledge of key words is supported through reading and writing activities, including shared reading and writing. Legible letter formation is explicitly taught and modelled on a daily basis. A wide variety of opportunities are provided for children to engage in writing activities and independently apply their phonic skills through role play, creative activities, computing and the outdoor area. We recognise that phonics is fundamental to children’s development as readers and writers throughout the primary school years. From EYFS and throughout Key Stage 1 children engage in high quality, focussed phonics lessons on a daily basis to develop both reading and writing skills, following the Letters and Sounds programme. Intervention programmes take place in Key Stage Two for children to develop phonic skills. This happens during English lessons and within guided writing groups. During this style of teaching, the teacher thinks aloud while writing and models strategies in front of the children, communicating the strategies being used. Teachers may model writing skills such as punctuating, rehearsing, proof reading, editing, word selection, sentence construction and paragraphing. This can take place in any curriculum lesson. This strategy can also be used in guided writing groups and has far greater input from the children than modelled writing. The teacher invites contributions from the children and teaches writing skills such as rehearsal, proof reading and editing, and production of a final draft. Teachers may also demonstrate how to create or use success criteria and marking ladders to self or peer assess. This may be the starting point for independent or guided writing. Providing focussed feedback to a group of learners with a similar identified need and then teaching skills to address it. Encouraging children to extend their writing further by writing effective questions on their work for the children to respond to. It can be seen that guided writing is a powerful teaching approach and provides a good opportunity for teacher assessment. 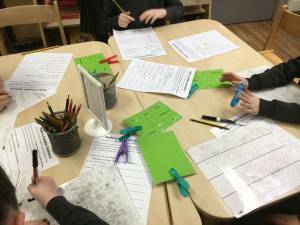 Teachers will plan guided writing sessions flexibly and will often plan to work with a particular group of children as a result of their teacher assessment of a previous writing task, where children with similar needs are identified. At other times, teachers may identify a group of children with similar learning needs during a lesson and decide to pull these children together immediately. We want children to enjoy writing from an early age. Our ultimate intention is to enable children to independently and effectively communicate in writing for a wide range of audiences. In EYFS children are encouraged to write independently using their own emergent writing from the time they come into school. Throughout Key Stages 1 and 2 children have the opportunity to write independently and at length. In EYFS and Key Stage 1, this is taught through phonics lessons. In Key Stage 2, children are set spellings appropriate to their ability, with a focus on learning and applying spelling rules. Year Two and all Key Stage Two classes follow the No Nonsense Spelling programme. Punctuation and grammar skills are taught within English lessons; however specific grammar lessons are taught where new skills are introduced. Within these lessons, children are taught the terminology and subject content specified in the National Curriculum. 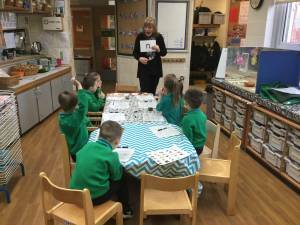 Subsequent lessons are then planned for the children to apply their learning and teachers use the No Nonsense Spelling programme to aid both teaching and planning. Writing has obvious links to many subjects in school and teachers aim to make the most of those links to create exciting and purposeful writing opportunities. Children practise and develop their writing skills in other subjects such as science, history or geography and use knowledge from other subjects to inform and inspire writing in English lessons.